Does Your Baby Need a Vitamin K Shot? The “journalists” (they are not) sat there and nodded sympathetically, especially to the part about parents who don’t vaccinate. This is absolute nonsense. I mean, does anyone even take these people seriously anymore? It’s absolutely bizarre to claim that something is “perfectly safe” because nothing is. (Everything has some risk.) And that part about parents not wanting any medical care? Have they ever bothered to ask parents why they are opting out? At any rate, no — they don’t ask, they don’t want to know, they are comfortable in their assumptions that parents who ask questions about medical procedures are crazy and that the shame is justified (it’s not). I believe parents deserve facts about these decisions so that they can make the best call for their children. They are smart enough to do that. I believe they need to have conversations with medical professionals that allow them to know the actual risks and benefits and then make an informed decision. You need that, mamas. You deserve that. And for those who don’t know, you can ask any questions you want of doctors. You can refuse any procedure you want. You do not have to do what they say just because they are doctors. Your body or your child’s body, your choice. Period. Let’s take a look at the facts about vitamin K.
Vitamin K is an essential vitamin. It is one that we need to get from our diet, and it plays a major role in blood clotting. Although our guts can synthesize vitamin K in small amounts (primarily the bacteria known as Bacteroides), we can’t make more than about 10% of what we need — and that’s assuming our gut flora is healthy. Over 90% of what we need must come from food like leafy greens (K1) or natto, or specific hard cheese like gouda or Romano (K2). K1 is water soluble and K2 is fat-soluble. There are also synthetic forms, known as K3, K4, and K5. Without enough vitamin K, people are at risk for internal or external bleeding, which can be uncontrolled and lead to serious consequences or even death. With too much vitamin K, we could end up with blood clots that could cause strokes or other serious consequences. Like most things, our bodies need to maintain a steady amount — neither too much nor too little. It doesn’t take much though, for blood to clot properly. The RDA for adults is 120 mcg for men and 90 mcg for women. So we know that vitamin K is necessary and that there are definite risks to having too little. Let’s look now at the issue with newborns. The media would have you believe that parents are refusing the vitamin K shot because they think it’s a vaccine (it’s not) or that they just want to keep their perfect little baby “natural.” Of course, it’s much more complicated than that. When I began this research, I believed what I had read: that vitamin K doesn’t cross the placenta, that all newborns are deficient, and that levels rebound within 8 days. But it turns out the evidence doesn’t really support any of that. After finding a whole lot of assumptions in the recent studies (from the last 10 years) with no data explaining how they were arrived upon, I looked back at studies from the 80s, hoping to find the ones that led to what we believe today and what informs the clinical practice of giving vitamin K shots to all babies. What are ‘typical’ newborn levels? What studies were used to find that, how large were they, how healthy were the mothers and babies? The studies that the “low vitamin K levels” were based on (that I found) tended to be fairly small (fewer than 40 mother-baby pairs) and many looked at the levels found in cord blood rather than the baby directly. And their results varied quite widely. Some found that vitamin K doesn’t cross the placenta at all. Some found that it does cross the placenta, but only under certain circumstances — it doesn’t happen readily. It may happen if a mother supplements with vitamin K during pregnancy, especially in the final days before birth (it seems to only happen when mothers have high levels). In fact, mothers who consumed natto during their pregnancy (which is rich in vit K2, MK-7) had placentas with much higher levels of vitamin K than mothers who didn’t supplement. The newborns in the studies did tend to have low levels of vitamin K, which ranged from 0.2 – 1.18 ng/mL. And most interestingly, whereas we’ve been told that levels rebound to “normal adult levels” by about 8 days of life, they actually do not (they do rise for the first 10 days, and then begin dropping again later). In one study, levels dropped after the first month, reaching the lowest level around 6 weeks of age, and stayed down for the first six months of life (with exclusive breastfeeding). The average level in the first six months of life was 0.2 – 0.24 ng/mL, about half of the average adult level. According to another study, even though the vitamin K levels of breastfed babies were significantly lower than formula-fed babies, the important coagulation factors were not lower! And, we know that when breastfeeding mothers are supplemented with vitamin K, it raises the levels in their breastmilk (more evidence). So we know from this information that a lot of what we have been told about vitamin K isn’t true. This leads us to believe that for the vast majority of babies, vitamin K supplementation is not necessary. So why do some babies experience problems? We all know that, unfortunately, not all babies are healthy and that some do experience vitamin K deficiency bleeding (VKDB). VKDB is broken down into three categories: early, classic, and late. Early VKDB is typically (almost always) found in babies whose mothers are on some kind of drug that lowers vitamin K levels, and it presents within 24 hours of birth. If your baby is at risk for this, you will know. Classic VKDB is often related to delayed or insufficient feeding and presents within 24 hours to 7 days after birth. It is typically mild ( bruising, some bleeding) but can become more serious in some cases. Late VKDB is very rare but very serious. The incidence is around 1 in 15,000 in babies who don’t receive a vitamin K shot, and babies who have liver problems or gut malabsorption issues are at greater risk. This is seen almost exclusively in breastfed babies because formula has vitamin K in it. About 20% of babies who end up with late-onset VKDB die and many have neurological damage. So, obviously, this is serious. But we have to ask — why breastfed babies? Levels of vitamin K are sharply lower in breastmilk than formula — but we covered above why, for most babies, that isn’t an issue. Why is it an issue for some? What is causing this to occur? We know that the babies with liver issues and gut malabsorption are at greater risk, which tells us that clearly, something is wrong, and that is leading to this problem. Vitamin K is largely stored in the liver, so if there is liver damage or an immature liver, levels will be lower and this could be a risk factor. The other major issue is gut health. An infant’s gut flora is needed to synthesize vitamin K, and also break down and absorb what is in their diet. If they do not have healthy gut flora — or rather, if mom doesn’t — then they will not get adequate vitamin K. There is not a lot of evidence in this area yet, but there is some evidence that poor colonization can lead to low vitamin K levels. Of course, breastfed infants will naturally have low vitamin K levels because their gut flora is primarily lactobacillus and bifidobacteria, which don’t synthesize vitamin K. Formula-fed babies will have high levels because of fortification of formula and because formula produces different gut flora, including Bacteroides, which do synthesize vitamin K.
I believe there is enough evidence to show that babies who have late-onset VKDB are unhealthy, and have specific risk factors that can and should be identified, and treated. That is, the underlying causes should be treated — not the vitamin K levels specifically. With new evidence from the package insert itself that the shot contains aluminum, there is clear evidence of danger. WARNING: This product contains aluminum that may be toxic. Aluminum may reach toxic levels with prolonged parenteral administration if kidney function is impaired. 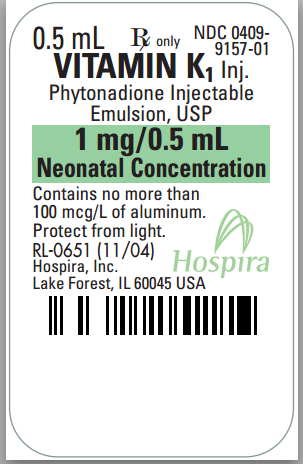 Premature neonates are particularly at risk because their kidneys are immature, and they required large amounts of calcium and phosphate solutions, which contain aluminum. Research indicates that patients with impaired kidney function, including premature neonates, who receive parenteral levels of aluminum at greater than 4 to 5 mcg/kg/day accumulate aluminum at levels associated with central nervous system and bone toxicity. Tissue loading may occur at even lower rates of administration. The average newborn weighs 7.5 lbs, which is approximately 3.4 kg. 5 mcg/kg is just 17 mcg. This shot contains approximately 100 mcg or almost 6 times the upper limit! We don’t know which infants are most at risk (beyond preemies) when they’re minutes old. They don’t need aluminum-containing injections in their bodies, ever. Only if there is a severe illness in mom or baby should it be considered? I had previously recommended that it be used in cases of gut dysbiosis, but upon the discovery of aluminum in the shot, I have amended that recommendation. I believe that the amount of aluminum is so harmful that it outweighs any potential benefits. What Can I Do Instead of the Shot? I would personally not choose either the shot or oral vitamin K (given my medical status). I don’t think that healthy, full-term babies should have higher levels of vitamin K. The levels are low for a reason and this should be left alone unless there is a specific risk factor present. Remember that although levels are low, clotting factors aren’t in most babies. The thing is, these interventions — like the vitamin K shot — are great for people who do have specific risk factors and can help to prevent serious illnesses. But they’re just not needed for healthy babies with no risk factors. We need to be assessing people as individuals and figuring out what they need, rather than making a one-size-fits-all policy. There is nothing that is appropriate for all! And we shouldn’t be scaring parents into making a decision without presenting them with all the facts. That’s just shady, in my opinion. That’s asking parents to just shut up and do what they’re told. If anyone ever says to you “Do this or your baby will die” (and it’s not a medical emergency-type situation) then say NO. You can always do some research and decide, later, to go ahead with the treatment with a more respectful doctor. But it should be an “absolutely not” answer to anyone who uses these types of scare tactics. I also recommend asking doctors like this to leave your room immediately and follow up by reporting them to the medical board for harassment. If you don’t hold them accountable, they will keep bullying parents. If you do have a particular risk, then I would try some of the following. Supplement with vitamin K-rich foods in pregnancy, especially in the final weeks. Natto, gouda, Romano cheese, leafy greens, etc. Some herbs, like alfalfa, are also rich in vitamin K. This needs to be done at least every 1 – 3 days consistently to make a difference, for at least a few weeks before birth. Same idea — continue supplementation through breastfeeding. I like to make an herbal tea which helps to balance hormones and which contains alfalfa. Try a probiotic supplement to improve your gut flora and so that you are better able to absorb and synthesize vitamin K yourself. If you have any issues with digestion (stomach pains, gas, diarrhea, constipation, frequent indigestion), eczema, seasonal allergies, etc. then you can assume that your gut flora isn’t as healthy as it should be and that probiotic supplements would benefit you. This is best done starting early in pregnancy. If you know that you have minor risk factors (like serious gut flora issues, allergies, chronic diarrhea, etc.) then it may be wise to give the baby oral vitamin K. This needs to be done repeatedly, every few days through 6 weeks of age. One dose is not enough to prevent the serious late-onset VKDB. If you know that your family is at serious risk because of a history of liver disease, if you had cholestasis in pregnancy, if you are on anti-convulsive medications — the vitamin K shot is probably necessary. Otherwise, it probably isn’t. How do you feel about the vitamin K shot? Did you get it, or not? Another good source of vitamin K is fermented veggies. Easy to make. Increases gut flora naturally. Nice article, straight forward presented information. I also wondered about supplements such as vitamin D and iron for breastfed babies. both of mine were exclusively breastfed and it wasn’t until my 2nd that I was told and strongly encouraged to give D as an infant and beyond and then getting me all worried that iron could be low. I know D is great, but I keep wondering why and that like you mentioned above, if they are breastfed and it is the natural way why we are continually told to add-on to breast milk? It doesn’t make sense…of course these won’t hurt the baby if given appropriately and if no additives are in the supplements…but if not necessary, why give it? I love that you can access all the research and analyze so thoroughly. I did not choose to have the Vitamin K shot for my daughter. Both the nurse and nurse midwife let me know to expect Department of Child and Family Services stopping by, if not at the hospital, then at home. We opted for no vaccinations. We kept our daughter with us at all times or her father attended the staff with her until our departure. I have been thinking about the vitamin k shot for a while. My daughter carried over an antibody from me when she was born and she was jaundiced for 6 weeks until it wore off. Apparently, I am told, that my future babies would have this happen to them. My daughter did have the k shot but from what I have read it actually hinders the liver from processing bilirubin. I am trying to become more informed so if I have to go through that situation again I know whats best. Great article. I appreciate the lack of hysteria in either direction. I had the shot for all 3, because of the high levels of anti coagulants I was on in pg for a DVT and then because of my risk factors to develop another one due to a genetic issue. The drug crosses the placenta and increases immediate bleeding risk for the babies. However, many of these broad health initiatives are administered because people don’t pay attwntion to risk factors, their own medical history, etc. So the meducal profession finds a way to save a few babies by standardizing something with low risk so that the few benefit by the administration to the many. Right? Maybe not, but it is something that must be considered. As such, we are responsible for educating ourselves around what is mandatory (not much) and necessary (some) so we can decide if we opt to participate in the “just in case” mentality. One other thing here about vitamin k. It is much more convenient for medical staff (something that seems to dictate many medical decisions, esp those advised for pregnant mothers and their babies) to perform a circumcision immediately after birth. They can’t do that if the blood doesn’t clot – so I believe this is one of main reasons for the vitamin K shot. It is also part of the reason for the timing of the Jewish bris – after clotting can naturally occur. I agree with you – I read an article that said all babies are dificient, especially breast-fed babies. So, if babies aren’t born with it and breast milk doesn’t have it, is it really a dificiency? Exactly! Nature has been producing healthy babies of all species for millennia and suddenly the pharmaceutical companies through their drug-pushing doctors want to “correct” this deficiency. How much research has been done asking the question “why are babies low in Vit K?” I have a sneaking suspicion there is a very good reason for it and we should just trust unto Nature that after a few trillion births that Nature probably knows what its bloody doing! Doctors irritate the hell out of me with their superior attitudes and their complete lack of humility when speaking on these matters. When the medical institution starts looking outside their square box and embracing other alternatives other than toxic medication then I might just trust their decisions. Until that day I will trust that nature and natural medicine is the way to true health. This is great and has been in my mind at lot lately as I’m due with a baby in January. Since I’ll be delivering in a NYC hospital I have absolutely no choice. If I refuse, they will call CPS on me (this was confirmed by my midwife, doula, and a L&D nurse from the hospital). Your article makes me feel a little better because I do have risk factors. I would have wanted the oral K but it’s not allowed here at all. I have tried- even got my pedi to prescribe it and assume responsibility of dosing and administering. If I try to follow through, CPS will be called. How can I protect the baby from the forced shot afterwards? I know this post is a few months old but I recently gave birth in a NYC hospital, well in the cab on the way to hospital but ended up in the hospital with the baby after she arrived. In NY, the shot is like 20,000 times what the baby would need and is above the minimum dose required. We had to get a lawyer to write a letter to our midwife and the hospital letting them know that we only wanted the minimum dose required. Once they got the letter they were totally fine with this and administered the minimum dose, this was the best we could do since as you said they call CPS if you refuse the shot. We were also able to get them to wait until 6 hours after birth rather than 1 hour . Hope that helps, if you want more info let me know. I LOVE this! It reminds me of something I read, “I praise you because I am fearfully and wonderfully made” Psalm 139:14a God made us! It doesn’t say we are wonderfully made with a vitamin k deficiency. Thanks for this article and the encouragement. Because this shot contains up to 1 mg of vitamin K, which can cause jaundice and who knows what other issues, we skipped this one. It doesn’t make sense to inject a newborn so that they can have an adult level of vitamin K. Also, if you’re breastfeeding, they’ll get it anyway from the colostrum and mature milk. Hi, I thought I would share an article I read on Vitamin K which includes some of the reasons we opted out of it that I did not see in your article, such as the shot being synthetic Vitamin K and 20,000 times the amount a newborn needs. Maybe this bilirubin issue is the “why” behind babies’ lower levels. Perhaps higher levels of vitamin K interfere with the liver’s ability to do its job? Very interesting point. 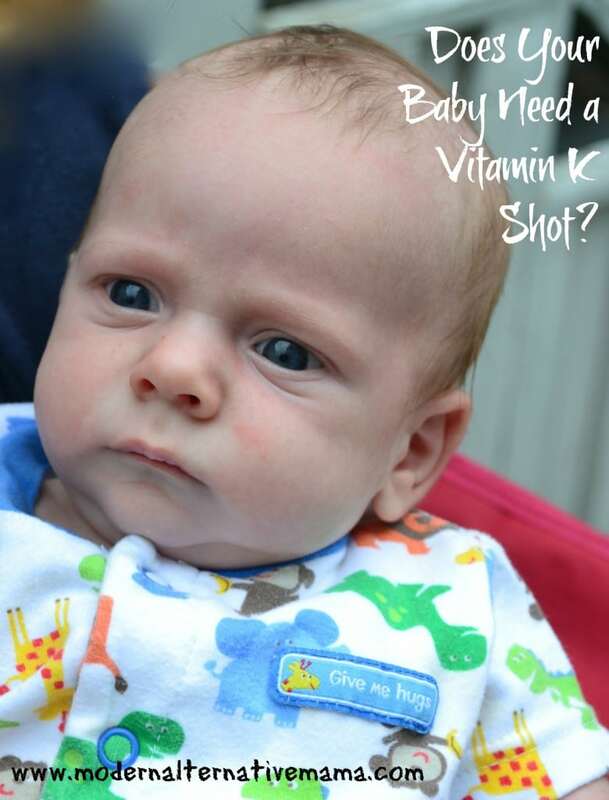 I opted out of the vitamin K shot for my baby, but he got a birth injury – a large hematoma on his head – my midwife recommended the vitamin K shot on day 3 after it appeared. He had very severe jaundice up until about 2 months until his body processed all the blood out of the hematoma. He was under the supervision of a pediatrician and never had to be admitted to the hospital because we were using homeopathy to treat him. I wish I had done more research now, but I am pretty certain the vitamin K shot put an unnecessary burden on his liver. He is very healthy now though! When did giving the vitamin k shoot become a normal thing to give newborns? Thank you for a great article. I have just published my own blog post on this very same subject. http://evidencebasedbirth.com/evidence-for-the-vitamin-k…/ <– this is the least biased article I've been able to find. very informative, just the facts. When my daughter questioned her obstetrician about opting out of the vitamin K injection, she told her that this was required by law (in Tennessee) and she would have no choice. What alternative does she have if the government continues to bully parents into submission?? This is such a GREAT read! I really appreciate your approach to dissecting this topic and fully exploring both sides of the need for the Vitamin K injection. I absolutely love your website, keep up the passion! Its contagious and we need more of it, from women, mothers and parents united. I did my research during my pregnancy and CHOSE to do the vitamin K shot. But it should always be a choice. When I had my first son I was young and I had no idea what they do with you baby after its born or why certain tests and shots are done. It’s weird how mainstream life teaches us to be submissive. Thankfully as I grew into adulthood, I’ve begun to question and know for myself what things are and why they are done. Why are new moms not educated or informed? I’m adding all of this in my health curriculum for homeschooling. I want my kids to know about vitamins, nutrition, vaccines, medicine. What it’s for and when it is needed, etc. Shot label says no more than 100mcg/L. The shot is not 1L. It is .5mL. I love your presentation! It’s so hard to find an article on a controversial subject that has some plain facts and logic instead of mind-numbingly boring dogma. I did my research and I was fine having it with both children. There are other things unnatural to our bodies that we each find benefit in if we decide to use it. But it’s our choice. That’s my big thing. Like you said, nothing is without risk. If a parent does or does not want to do a test or shot and they reached that decision after researching and thinking about it, their choice should be respected because they have chose the risks they are most comfortable with. And they really should do more individual case studies. One-size-fits-all is quite ill-fitting indeed. If they started doing that with underwear, most people would go commando. Any thoughts on how erythromycin topical gel used by mom for about 4 weeks (to treat folliculitis) can effect baby’s risk for being a vitamin k shot candidate? Trying to make the most informed choice. I am not sure about that one, I would look at the package insert or talk to your health care professional. My son is a perfectly healthy 2 week old. We declined vitamin k at birth and up until now we have not done any oral form. My one concern is we are going to have him circumcised. We wanted this done on the 8th day however due to a lack of cooperation from doctors, it hasn’t happened yet. I’m wondering if circumcision would be considered a “risk factor” and a reason to give him an oral form of vitamin k. He also is exclusively breastfed. I am aware that with circumcision there is already a risk of bleeding (vitamin k shot or not). I’m wondering if there would be an increased risk without using an oral form. His circumcision will most likely be done next week when he will be 3 weeks old. The shot contains up to 100 mcg/l, which means it contains up to 0.05 mcg. That is well below the specified maximums of 4-5 mcg/kg/day. I’m not exactly a proponent of the shot, but we’d do well to be a little more rigorous!